I am the kind of person who appreciates texture. Texture is a make or break for me, particularly in food. Example – I love the flavor of pears but the grainy, sandy texture is a real turn off. On the other hand, a plain hamburger bun is fine, but sprinkled with crunchy little poppy seeds I find it hard to resist. My first experience with a cornmeal cake was one filled with trepidation. I had it firmly set in my mind that a cake with cornmeal in it would have the texture of cornbread and I was not prepared to like that. I’m glad I set my preconceptions aside because the cake was a revelation. Buttery, moist, and with a very pleasant lightly gritty texture I fell in love and was terribly happy to be wrong. 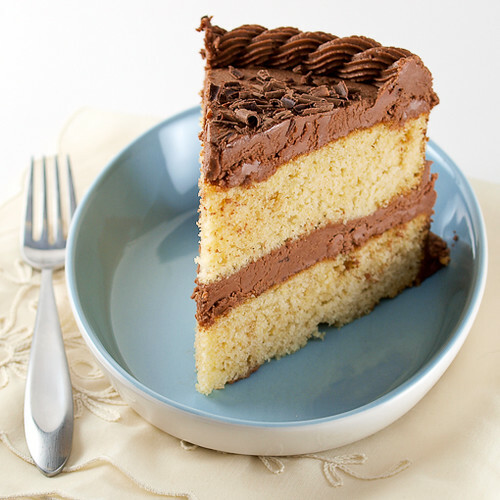 Cornmeal provides a lovely texture to this cake, but it is not the only player we should concern ourselves with. Buttermilk plays a major role for two reasons. 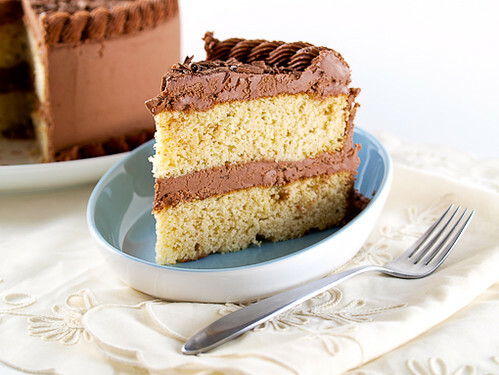 First, it helps the cake stay light and moist. 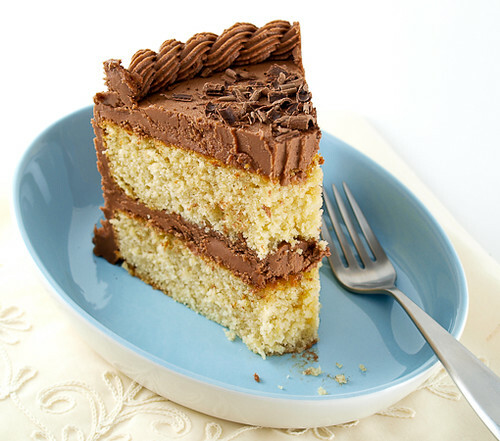 Second, the subtle tang rounds out the cakes flavor and keeps it from being cloying on the palate. 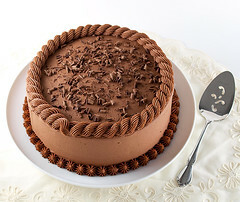 Not to say that this cake is terribly refined. It is a homemade cake int he best possible sense. Buttermilk also features in the frosting which is almost fudge like once set. For those who love to decorate cakes I must tell you that it spreads and pipes like an absolute dream. If you have a summer BBQ or pot-luck I would like to suggest this recipe, but lets be honest … do you really need a reason for good cake? Heat the oven to 350 F and spray two 8-inch pans with non-stick cooking spray. 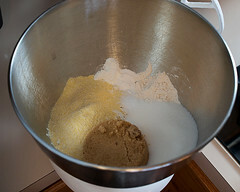 In a large bowl sift together the flour, cornmeal, baking powder, baking soda, salt, sugar, and brown sugar. In a medium bowl whisk together the butter, buttermilk, vanilla, and eggs until well combined. 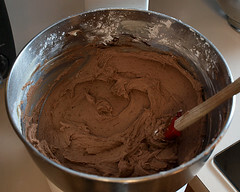 Pour the wet ingredients into the dry and mix until there are no large lumps of flour remaining. A few small lumps are fine. 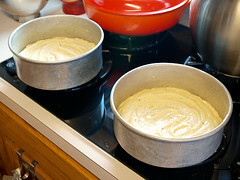 Divide the batter between the prepared pans and bake for 25 to 30 minutes, or until the cake pulls away from the side of the pan and springs back when gently pressed in the center. Cool in the pan for 10 minutes before turning out onto a wire rack to cool completely. While the cake cools prepare the frosting. 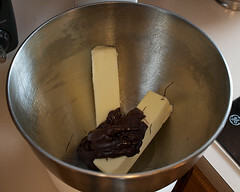 In a large bowl cream together the melted chocolate and butter until smooth and creamy. 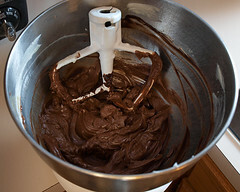 Add in the vanilla, cocoa powder, and powdered sugar and begin mixing. Slowly add in the buttermilk until the frosting reaches your desired spreading consistency. If the frosting is stiff feel free to add a few more drops of buttermilk. 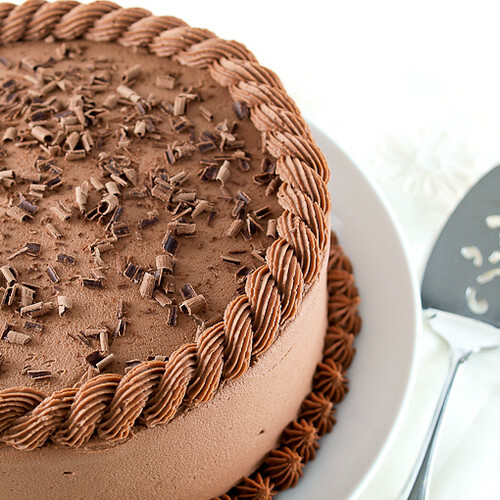 Once the cake is cool frost and decorate as desired.